Or craving soft serve on a hot summer days? 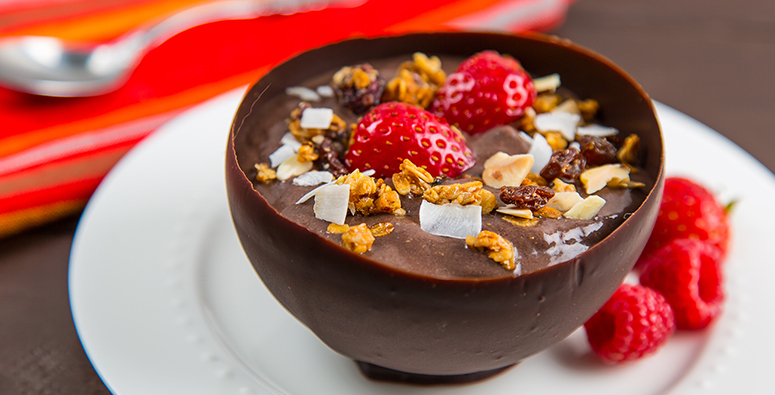 Opt in for a decadent smoothie bowl that won’t take too much time in the kitchen. There’s really no bad time for a smoothie bowl. Now, what the heck is a smoothie bowl? Is it as simple as a smoothie in bowl? Yes! The key difference between a smoothie and a smoothie bowl is the amount of liquid that you blend your frozen fruit up with. You create smoothie bowls by adding ¼ to ½ of a cup of liquid instead of 1 to 1½ cups. Plus, another major plus of smoothie bowls is the variety of toppings that you can add once you transferred it to a bowl, such as crunchy granola and fresh fruit. Ever attempted to make a vegan smoothie bowl but it wasn’t quite what you expected? My top smoothie bowl hacks won’t let you down! Skip fresh: frozen fruit will thicken your smoothie so you can eat it with a spoon. Keep liquids to a minimum. Start with 2 Tablespoons and gradually add more if you feel it isn’t coming together. I love using plant-based milk such as almondmilk or hempmilk. A high-speed blender or food processor will do the trick. Why? Because it’s quite powerful and will help you blend all ingredients up in no time without the fruit melting. Don’t forget to scrape down the sides once or twice. Use toppings with different textures. Creativity has no limits here. I’m loving crunchy granola, cacao nibs, coconut flakes, hemp seeds, chia seeds, creamy rich nut butters, chewy pieces of dried fruit, and some fresh pieces of fruit...the options are endless! A plant-based protein powder will not only add plant-based protein, but also make the consistency rich and creamy. I see it as a substitute for the double cream used in delicious gelatos. The Aḉai Bowl with Vega® Protein & Greens is a classic. Bring the feeling of Hawaiian sunsets and romantic walks on the beach to your patio with this creamy bowl of deliciousness. A great way to sneak some greens you’re making your smoothie bowl. 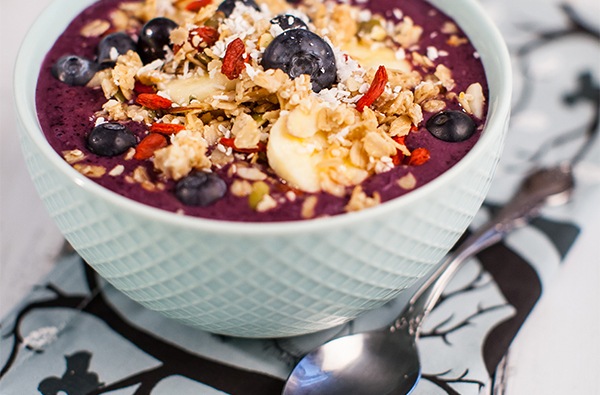 The Breakfast Criminals’ Heart Chakra Smoothie Bowl with Vega One® won’t disappoint. You will never guess the ingredients when spooning up this luscious smoothie bowl. Your love for this bowl will drag-on and on. Take a trip to Central America or Southeast Asia right from your couch with this Pitaya (Dragonfruit) Smoothie Bowl with Vega Sport® Protein. Each spoon is an explosion of different flavors and textures in your mouth. Smoothie bowl parteeey! This Chocolate Smoothie Sundae Bar with Vega® Essentials will steal the show at every brunch or pool party. Everyone can let their creativity run loose and make it rain sprinkles and crunchy granola! Step up your brunch game and impress your friends with this next level smoothie bowl: Farmer’s Market Protein Smoothie in Granola Bowls with Vega One®. The best part of it? You don’t have to wash the bowls after indulging. Win, win! Tag your smoothie bowl pics with #VegaTeam on Social Media so we can feature them.